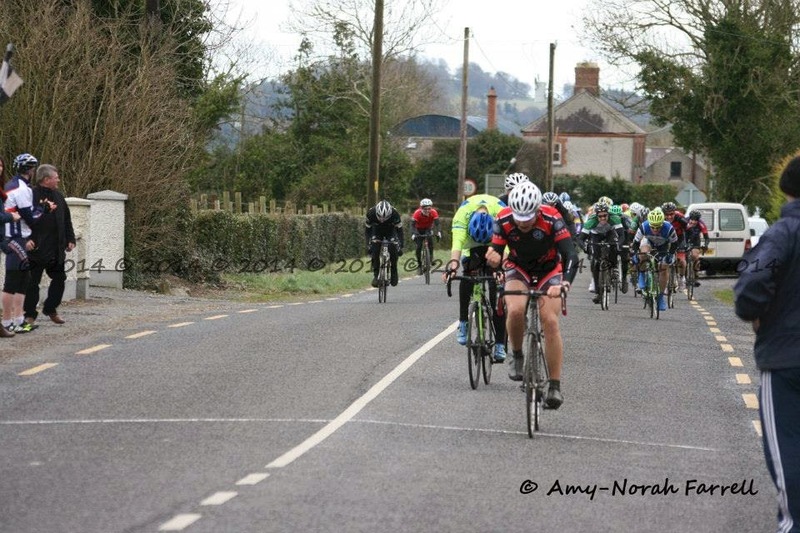 My second race of the year was the Boyne GP up in Slane, Co. Meath. After the Newbridge GP race the week before, the nerves were a bit delayed this week, only kicking in as I waited for the roll out to begin. The course this week was 5 laps of a lumpy and short 12km circuit with around 135 meters of climbing every lap. Not exactly ideal for my large frame! When I woke up that day, my legs were feeling pretty heavy. A combination of numerous work shifts (5 hours of bar work takes a surprising amount out of your legs) and doing my track accreditation the day before the race making my legs feel like lead. But I had committed to the race and decided to see what would happen. 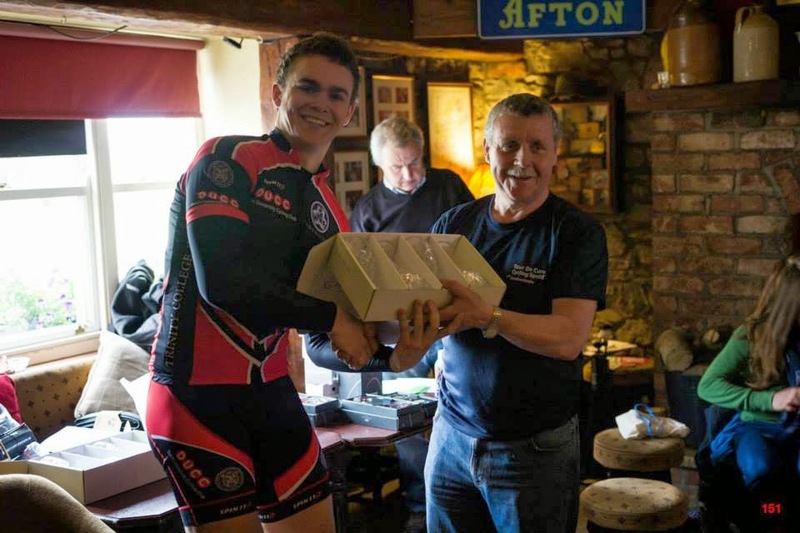 Patrick Smith and Dermot Cooney were riding the A3 race, which took place after the A4 race had finished, which meant that I had two soigneurs/photographers/mechanics/directors for my race. I felt like quite the pro having cameras snapping away at me and a car following me! Patrick even gave advice and told me to stay away from the front of the peloton and conserve my energy in the bunch for the final uphill drag to the line. Yes sir! The race begun after we were told by the race directors that with the Ladies race starting after the A4’s, we would have to be aggressive in order to avoid being caught by them. There was no neutral roll out this week, things kick off right from the gun. Within a few hundred meters, the peloton was flying at around 45km/h and we were all strung out. One guy had a pinch flat right in front of me, but thankfully because of his handling skills, he kept things under control and didn’t take me out, which is always nice. Eventually the bunch hit the first little hill and everyone came together, calming down a bit. A few riders tried to break free in order to form the breakaway of the day but none of these efforts were sticking with the riders being sucked back into the peloton. 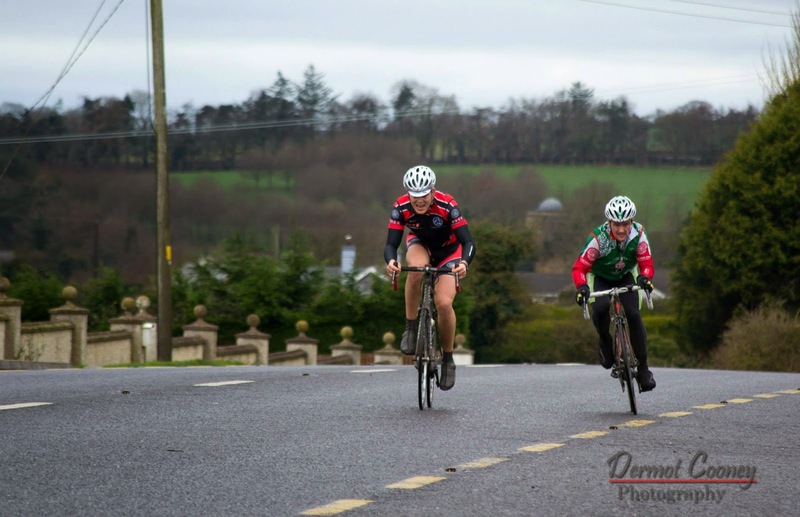 Finally, one rider from the Dundalk Cycling Club made a decent effort on a downhill section gaining around 50 meters. Because my legs were feeling heavy, I thought that there’d be no way I could hold on to the bunch all day on such a hilly route. So decided to bridge across to the Dundalk rider and see what we could do. Shooting around the peloton on the downhill section slipped into my aero tuck, which I had been practicing a lot in training spins, and caught the Dundalk rider and shouting “Will we try something? !” before passing him out. 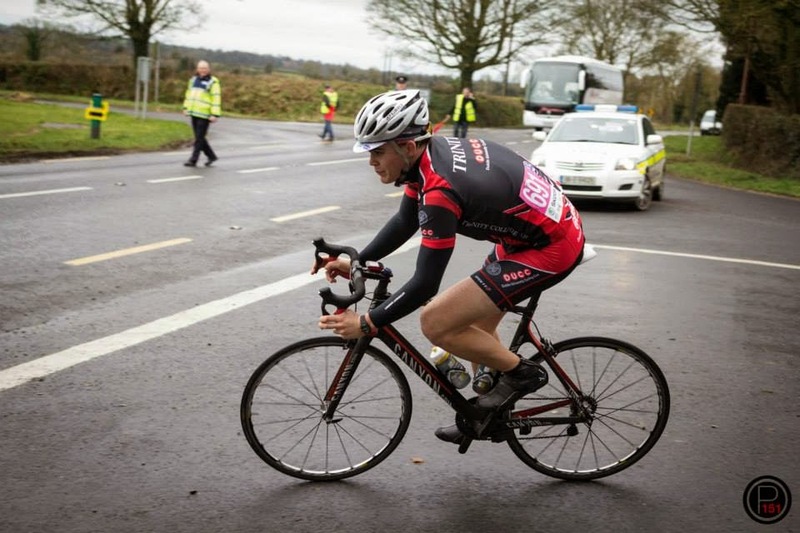 Once I had reached the bottom of the decent, I looked around and saw the Dundalk rider had been caught by the peloton and it was just me on my own out in front. So I thought to myself ‘Feck it, let’s just go for it and see what happens’. At this stage we had covered 5km of 62km, so it wasn’t wise at all to go for a solo breakaway in substantially blustery conditions. But all I could think of were examples of magnificent solo breakaway by the pros and the glorious legends formed by them, so I drove on. For 8km I had around a 200 meter advantage over the peloton. I kept thinking that it was just like being out on a solo training spin putting in an effort with no one around to see it. Eventually I heeded the words of my director and pulled up knowing it was a doomed effort from the start, as so many breakaways are, and that I should let the peloton reabsorb me. Bid for solo breakaway glory. The peloton caught up with me just before the finish line on the 1st lap. 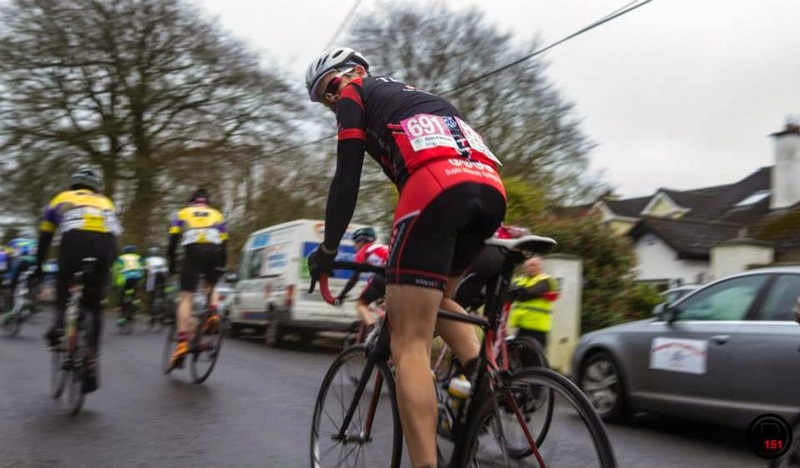 I slotted in near the front of the group and just sat in for the next lap, with nothing eventful happening. Around half way through the 2nd lap, we came across what turned out to be a horrific crash from the Ladies’ race, with three girls hospitalised and some mangled faces (thankfully there were no serious injurys). It didn’t do much for the confidence in the A4 peloton as we slowly passed the crash scene. Once the peloton was through the crash scene, thing started to heat up once again, with a duo of riders heading up the road. They looked to be working well together which is an indicator that it could stick. I liked the look of the two riders and bridged across to add my firepower to the effort, just as we were crossing the finish line of the 2nd lap. 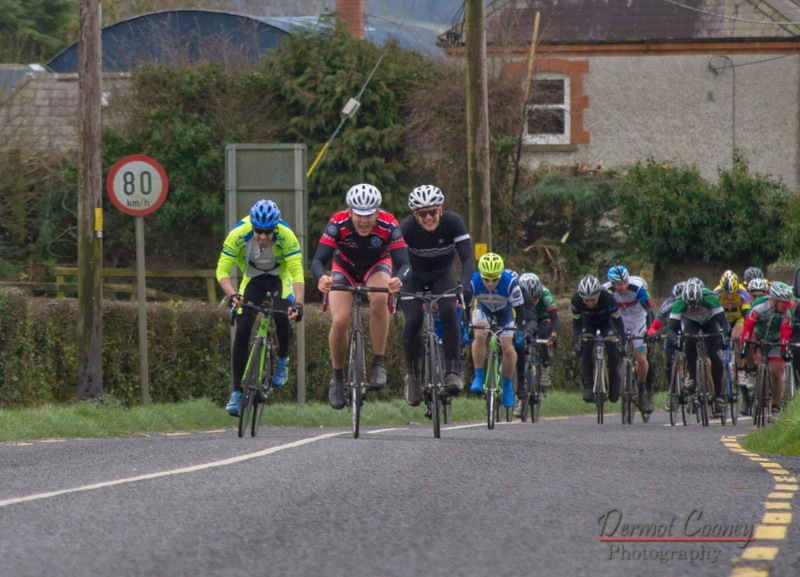 The two riders, one from Dublin Wheelers called Edward Brennan and the other was another rider from Dundalk Cycling Club called Alan Bingham, were happy to work together and so we formed the breakaway of the day, getting around a 30-40 second gap on the peloton. We worked well together, each taking our turn in the wind and sheltering the others. Alan was initially buggered and just hanging on to Edward and me, but eventually started putting in some big turns on the front. I was bigger than the other two, which resulted in more work being done by me! But I was happy to be out in front and working hard. It’s a nice feeling being in the breakaway, I can’t really explain it. You feel like you’re the centre of attention, as you’re not hiding in a bunch, and you’re technically the virtual leaders of the race. After 1 lap in the breakaway, we lost Edward. Speaking to him afterwards he said he thought it was a bit too much effort so early on and he’d decided to head back to the bunch and conserve energy. Edward went on to come 3rd in what was his first competitive race which is a fantastic result for him. Alan and I decided to drive on. Alan was obviously an experienced rider, giving me some nice tips and calming me down as I was probably too excited to be in the breakaway. At one stage I was even ready to call it quits and head back to the bunch but Alan kept me going explaining that no one would be willing to work in the peloton which would inhibit the chase. He was right as we managed to maintain our gap of 30 seconds to halfway through the penultimate lap. Throughout the whole breakaway, Alan and I worked well together. Alan generally taking us up the numerous small climbs and me taking over on the descents and flats. I also followed Alan in the corners as he took much better lines than me. It turns out he was an ex-mountain biker which explained his superb handling skills. With around 20km remaining in the race, we still had a sizable gap and I started to think we could actually make it all the way to the end and I started day dreaming about what winning would be like. Unfortunately, Alan and myself were getting tired. Alan and myself in the days main breakaway. Slowly but surely Alan and I were fading. We could see the peloton getting closer and closer. As we were coming up to the finish line to start our final lap, 4 riders bridged across from the peloton which was now around 70 meters behind us. The 4 riders who bridged across to us were much fresher than Alan or me and added a substantial amount of firepower to the breakaway. Alan and I hung on to their coat tails as they drove the pace along. Eventually I felt good again and started to add to the efforts to keep us away to the end. I knew I only needed a 7th place to be upgraded to the A3 category (as I had points carried from last year), which was a big goal of mine for the season. So was happy to give my all to this group of 6 to keep us going to the end, content with the upgrade. We were all encouraging ourselves and trying to keep driving till the end before we tried to outfox each other for the win. We consistently had a 50 meter gap over the peloton for the duration of our break. Heading into the penultimate corner before the finish, I was 2nd in line. The rider who went in first unfortunately lost grip on his back wheel and slid out. I managed to avoid the rider and selfishly didn’t think twice about him and continued driving the pace. With the peloton breathing down our necks, I knew we couldn’t afford to stall for the rider to get back on. I then saw there were 4 of us left. Unfortunately, Alan had also slipped on the penultimate corner and crashed out. The four of us left continued to keep driving. One of the riders in the group refused to do any work which was really hurting the harmony of the group. I kept shouting at him to come through and do some work but he kept refusing saying he was wrecked and couldn’t do anything other than hang on. He looked pretty fresh to me so I thought he was just using us as a free ride to the finish. Thankfully he wasn’t as we soon lost him to the peloton. I don’t recall many details from that last 3km. I have never gone so into red as I did on that drag, reaching 104% of my “maximum” heart rate. I just drove and drove and drove. I could see the finish line up the road and couldn’t even look behind as I knew the bunch was right behind gaining ground. The final drive to the line. After what seemed like a lifetime of agony, I made it. As I crossed the line in first place, I let out a primeval roar of ecstasy and happiness. There was no extravagant celebration, only a clenching my fist (I was simply too fucked to do anything else!). It’s ironic, because on our Thursday club spin, we had been discussing what celebrations we’d do if we actually won, coming up with excessively more elaborate celebration. I’ll just have to win another race to try them out! If I’d been caught by the peloton with a few meters left, I would have been devastated after all the effort that I had put in. But winning my first race will keep a smile on my face for a while yet! After receiving hugs from Dermot and Patrick, what I’d achieved started to sink in. I was extremely proud of my performance and what could come of it. Starting the day my legs felt wrecked, but I still managed to essentially stay in the breakaway all day and still have the strength to hold off the peloton on the final drag. These are promising indicators for the upcoming season and only after my second race of the season. As a prize for coming first, I received a crystal wine glass set, which is lovely but unfortunately I don’t drink wine, I’ll just have to start trying! My next goal is to get into the A2 category but I can’t wait to cycle with some team mates in the A3 category. But for now I’ll enjoy my win, at least I was the happiest barman in work that night! Special thanks to Patrick Smith and Dermot Cooney for the lift, pictures and support on the day.